I've decided that instead of sharing all of my cooking from the week, I'm going to focus on one meal that I made and discuss it a bit more in depth. As before, the meal will be based off the produce we get each week from the Tucson CSA (Community Sponsored Agriculture) project and will have a family focus, since three of my eaters are under 7. The subtitle for this week's post could be "How to get scary looking greens into your kids." See that pictures above? Not a bit of green in sight. Cheating? A little, yes, but I want my kids know that food made with and from vegetables doesn't always have to look "grown up". 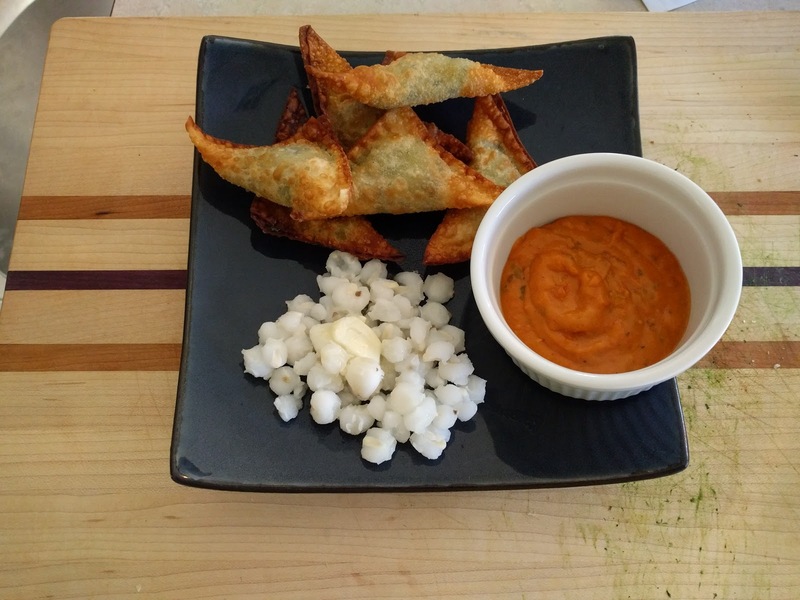 This week I made fried ravioli, stuffed with rapini, bacon, ricotta, and parmesan, and I served it with store-bought spaghetti sauce and canned hominy. It was an easy week-night meal and the fact that the kids could eat most of dinner with their fingers gave all of us a nice break from the constant "Use your fork!" reminders. 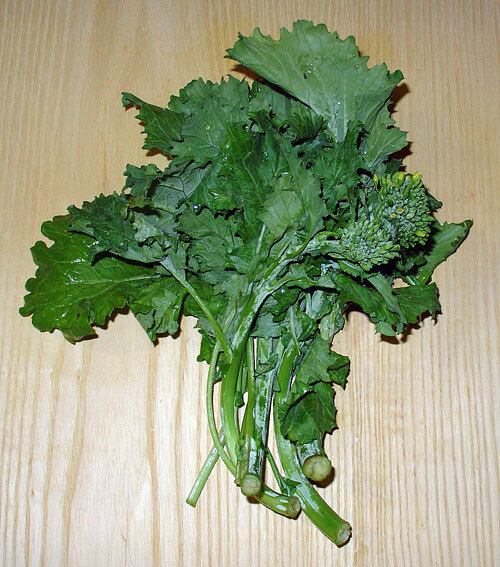 Rapini is also called broccoli rabe and can be found in bunches, with dark green spiky-edged leaves. It has a bit of a bitter taste and while D likes it raw in salads, I prefer to cut the stems out and cook the leaves. They can be used in any recipe that calls for spinach. Bring a large pot of salted water to a rolling boil. Rinse rapini and pat dry. Cut stems away from leaves and discard. Cook rapini leaves in boiling water until wilted, about 5 minutes. Drain leaves in a colander and then squeeze out as much extra moisture as possible (I used cheese cloth). Let leaves cool, then finely chop and add them to the bacon and cheeses. Season to taste with Italian or other seasonings (I used garlic powder and Mrs Dash Garlic and Herb seasoning). 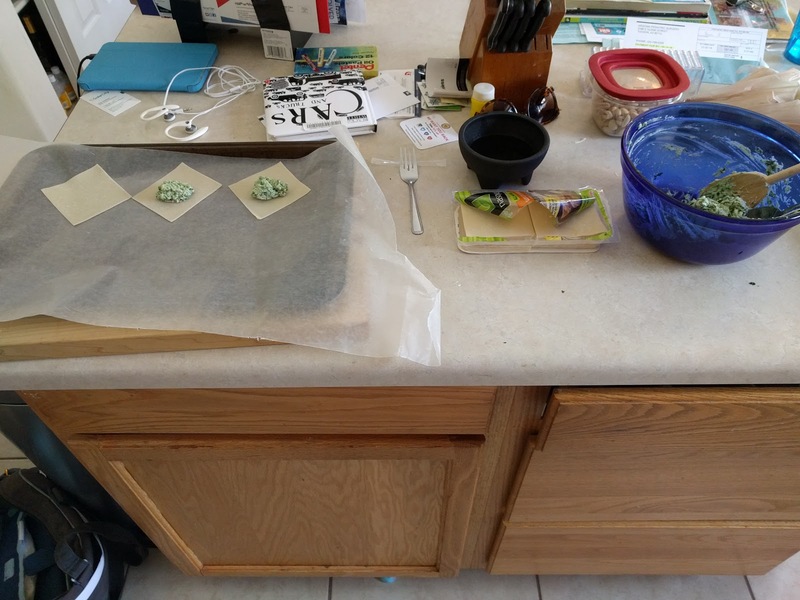 Line a baking sheet with wax paper and lay out several wonton wrappers. Place a tablespoon of filling on each. 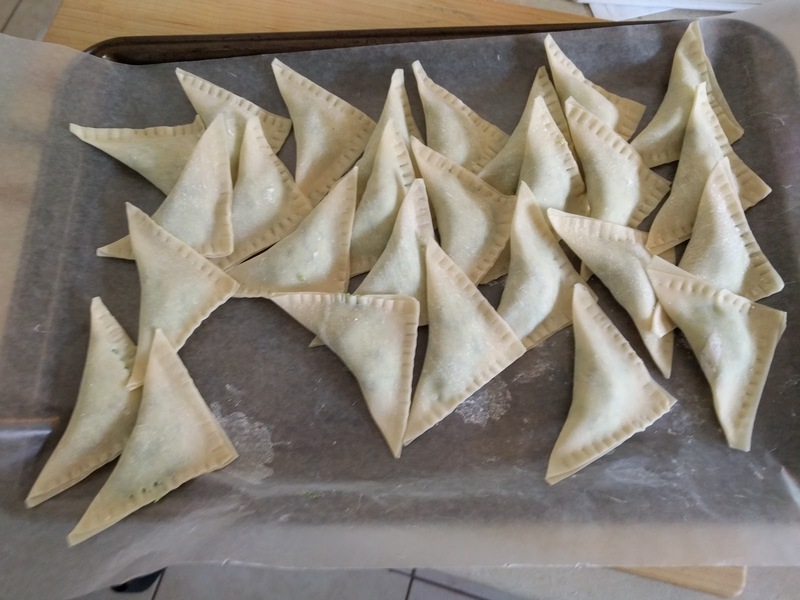 Wet all the edges of the wonton wrapper and fold into a triangle, pressing the edges to seal them. I also pressed the edges with a fork to make sure they sealed. 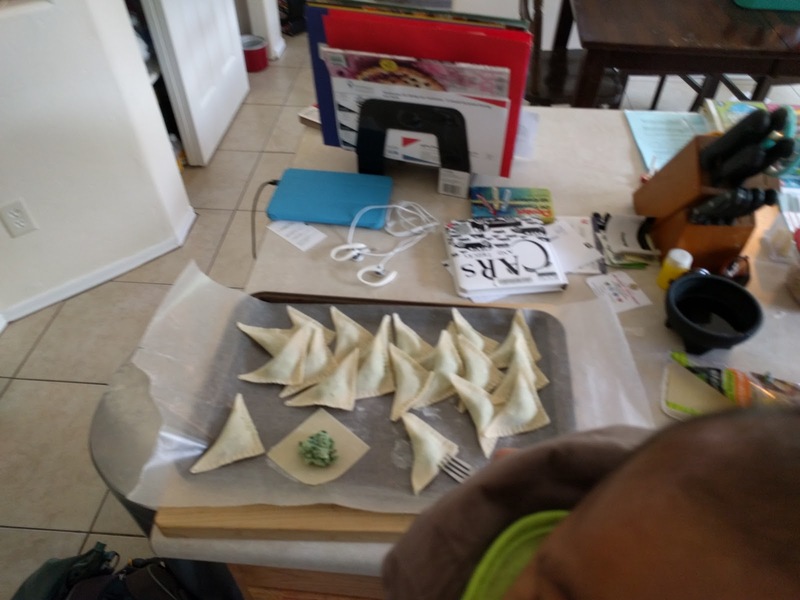 You can fry the wontons immediately or keep them in the refrigerator as is for up to 6 hours. If you're making them for the next day, I would store them in a plastic container, with each layer separated by wax paper. To fry, pour oil into a dutch oven to a depth of 2 inches. When it reaches 300 degrees (or when a cube of bread browns quickly in it) you're ready to go. 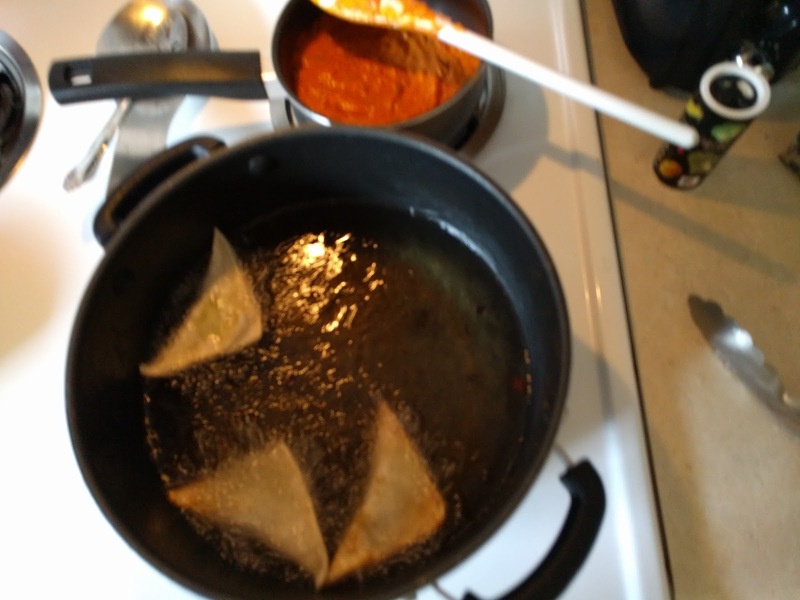 I fried three ravioli at time- don't crowd the pan or you won't be able to maintain a consistent frying temperature. Fry for 1-2 minutes on each side, just long enough to turn the wonton wrapper a light, golden brown. Drain on paper towels and keep warm in a 200 degree oven until you're ready to serve. This recipe went over well with the kids. The rapini didn't add a noticeable "green" flavor to the ravioli and they liked that they could eat with their fingers and dip up as much spaghetti sauce as they wanted. I would call this dinner a success and will probably be making it again. 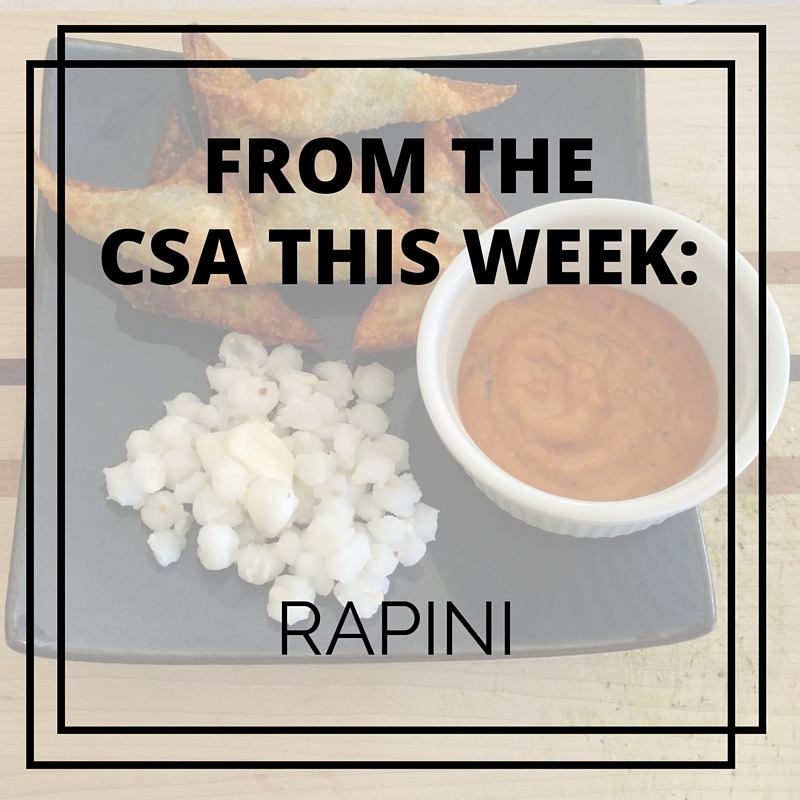 Have you cooked with rapini before? Do you have a favorite rapini recipe? If you try my recipe, let me know how it turns out! Love this. I didn't know that broccoli rabe had another name! This looks fantastic, and I love that it's kind friendly too! 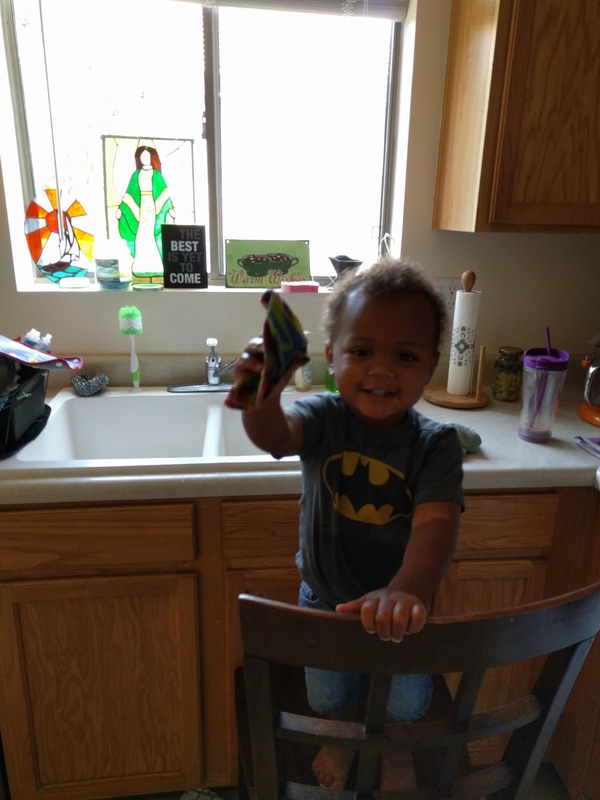 Thanks for sharing this on #shinebloghop. So glad you were able to join us again this week.